Those are said to be the two greatest words for advancing humanity. And there are, at last count, 2,900 former seniors at Albion High School/Boone Central who were taught by Randall Henning during his 45-year teaching career there. 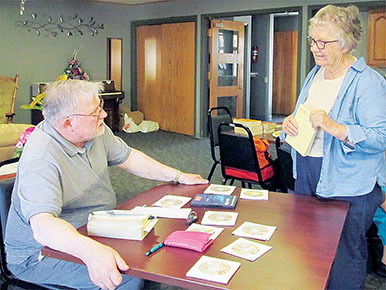 These days, many adults attend book reviews taught by Henning and offered by the Albion Area Arts Council. “Frankly, I never had a class I didn’t want to go to,” he said. Henning is known for teaching any subject in depth, complete with artifacts, videos and supplemented information. Gathering information on the subjects he teaches is something he enjoys, he said. Henning’s early trips abroad were usually spent gathering materials and more information for his students. Later, as he has taken his nieces and nephews abroad, he has enjoyed seeing their reactions to places he had been to earlier.